AI, Blockchain, Big Data etc are the buzzwords of today. Technology is shrinking our world and the hospitality industry is no different. These buzzwords are having a great impact on the hospitality industry as the margins for excellence are decreasing. Thus conventional courses are giving way to online courses and short courses backed by technology. Here, in this post, we present 10 popular short courses in Hospitality Management. While we present 10 popular courses, we would ensure to leave you with a lot of resources to explore hundreds of other short hospitality management courses. These would include online hospitality courses, on-campus hotel management courses and distance learning courses. We have dedicated few others posts on this Global Hospitality Portal for FREE and Paid Online hospitality Courses as well as top Hospitality Industry certificates. Let’s get on with the list now without any further ado. Before we begin, here’s a disclaimer. We don’t intend to make any claims through this listing nor do we endorse or promote any of these courses. We have not sponsored any of these courses. Like other posts on this hospitality portal, this article is intended to provide the best possible information to our 200,000+ hospitality network. So, please use this list of short hospitality courses as the place to start your research. We have ensured to provide supporting links for further study. Also, these courses are not ranked in any order. It is an extremely difficult task to rank short courses due to lack of exact data. We have used the credibility of the Hospitality Management Institute, popularity and online reputation to prepare the list. We advise our readers to carry on due diligence in deciding the best course. Course details and eligibility– Check the Course page of EHL for further details and to download the brochure. This is one of the Top Hospitality Schools in the world that also provides several short hospitality training courses like the one mentioned here. Switzerland is home to several great hotel management schools and EHL has been regarded as one of the most reputed ones. While all the short courses offered by Ecole Hoteliere de Lausanne or EHL (as it is popularly known as) are a touch on the expensive side, they provide great career prospects. The institute was established in 1893 and has been a quality institute ever since. Course details and Eligibility Criteria– Check the Official webpage of this short hospitality course Here. It is a highly reputed certificate course that focuses on sustainability and current issues of the global hospitality industry. Course Details– Check the material and Download Course here. Upgrade your knowledge about the customer through this high-quality material from one of the most reputed institutes in the world. This course used to be one of the most popular short Courses in hospitality management. It is now made available free to all. Course Details– Check the SHA Module Page for further details. There are a number of other Online short hospitality courses which are on offer by the highly reputed Cornell University. There are various Distance Learning and Part Time Hospitality Management courses offered by American Hotel & Lodging Educational Institute. These courses include the Hospitality Management Diploma, Hospitality Operations certificate, Hotel Industry foundations and various other hospitality and tourism-related specialisations. Course details– Check out the course page of University of Derby for further details on this course. And there are a lot more of similar ones. There are over 200 short courses in hospitality management and tourism which are quite popular. These are available online or part-time globally. Distance Learning Portal provides a good compilation of a lot of these courses for those who would like to check an array of similar courses. 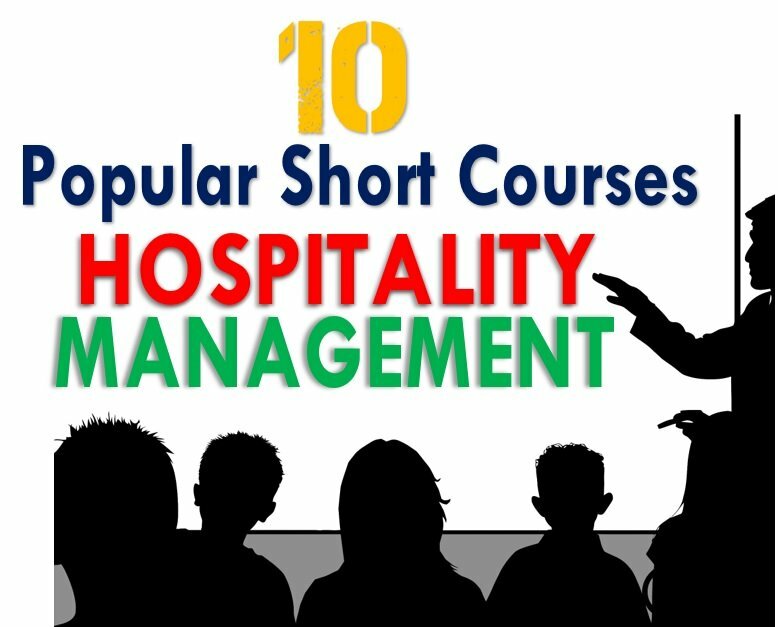 While we could have gone on and on in listing the most popular short courses in hospitality management, we have decided to limit the post to 10 courses. Then the scope has been expanded through various links given in this post for further exploring over 300 short hospitality management courses. A few of these courses are provided by top hospitality institutes like EHL, Cornell etc. A lot of courses are also provided by the extremely repute AHLA. However, there were a lot of courses recommended in this article that are free and can be used for educational purposes. A lot of the courses are also extremely cost effective that can help hoteliers in gaining competitive advantages. There can be different types of hotel management courses but each come with their own set of advantages. Experienced hotel managers can opt for flexible part time or online courses while the mid managers or fresh graduates can look for short full time courses for on campus exposure. On campus, courses are also good for networking and can suit everyone. We sincerely hope that the list provides all our readers ample information to explore short courses further that would help them shine in the hospitality arena.